We are engaged in offering our clients premium quality Electronic Hanging Weighing Scales that are portable and can be taken to any place. Widely acclaimed for various features such as simple, reliable and weather resistant, these are highly demanded by various industries. Our electronic hanging weighing scales optimally utilize the head room necessities of our customers. 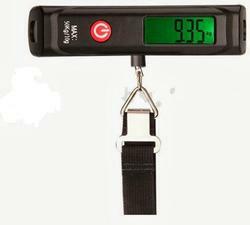 We are engaged in providing A-08 Electronic Hanging Scales to our clients as per their requirements. These weighing scales are highly demanded across the globe and are known for simple, reliable and weather resistant. Available in various capacities, these scales are used in the measurement of load and force in conjunction with all types of lifting and pulling devices. Our clients can avail these A-08 Electronic Hanging weighing scales in various customized packing. 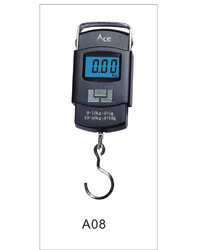 We are engaged in providing A-08 Electronic Hanging Scales to our clients as per their requirements. These weighing scales are highly demanded across the globe and are known for simple, reliable and weather resistant. Available in various capacities, these weighing scales are used in the measurement of load and force in conjunction with all types of lifting and pulling devices. Our clients can avail these A-08 Electronic Hanging weighing scales in various customized packing. 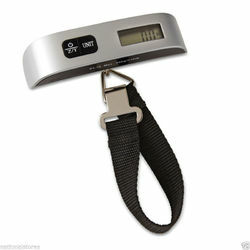 We are engaged in providing WH - 12 Electronic Luggage Hanging weighing scales to our clients as per their requirements. These weighing scales are highly demanded across the globe and are known for simple, reliable and weather resistant. Available in various capacities, these scales are used in the measurement of load and force in conjunction with all types of lifting and pulling devices. Our clients can avail these WH - 12 Electronic Hanging weighing scales in various customized packing. We are engaged in providing LUGGAGE Electronic Hanging weighing scales to our clients as per their requirements. These weighing scales are highly demanded across the globe and are known for simple, reliable and weather resistant. Available in various capacities, these scales are used in the measurement of load and force in conjunction with all types of lifting and pulling devices. Our clients can avail these LUGGAGE Electronic Hanging weighing scales in various customized packing. 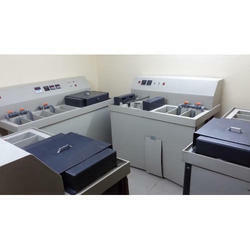 We are deal in Gold Electroforming Machine.